We’d love your help. Let us know what’s wrong with this preview of Annie Spruce, The Dog That Didn't Die by Cassandra Rankin. In the woods of Alaska, an unexpected and bloody surprise awaits a family at a rural pull-off. Little did they know, the mess they stumbled upon would soon build the faith of a small girl, her family, and a homeless man. Their story is a tender display of how, by answering the smallest of prayers, God shows us the bigness of Him. Annie Spruce is the true account of an extr In the woods of Alaska, an unexpected and bloody surprise awaits a family at a rural pull-off. Little did they know, the mess they stumbled upon would soon build the faith of a small girl, her family, and a homeless man. 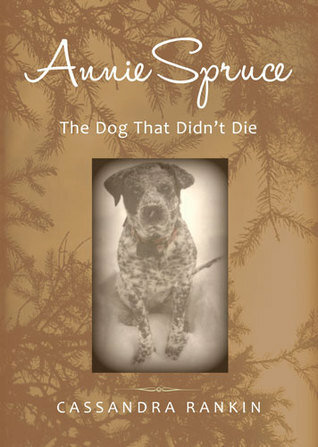 To ask other readers questions about Annie Spruce, The Dog That Didn't Die, please sign up. let Thy loving kindness and Thy truth continually preserve me. God’s presence in our lives often takes form in the tender mercies we experience as we go about the ordinary business of living. We seem to expect God to show up only in the big things: illnesses miraculously cured, seas that part, manna dropping from heaven. Yet, we experience God’s grace most often in the small things. The person whose encouragement picks us up just when we need it, the warmth of a loved one’s caress, and the bright, happy eyes of our children – God hides in these gentle places, waiting for us to find him out. Cassandra Rankin has a keen ability to recognize God’s presence in these tender areas of life. To illustrate His goodness and faithfulness, she uses the compelling story of a dog too courageous and strong-hearted to die. She and her family first met the sweet character they came to call Annie Spruce when they discovered her tied to a post, shot in the head and left to die in the Alaskan woods. They rescued Annie, got her medical care, and brought her home to live with them. Eloquently, simply, Rankin shares the lessons that Annie taught the family about loyalty, trust, determination and love. In the telling of Annie’s story, she reminds us that God was the orchestrator of the events that occurred – just as He is in every story. Our job is to pay attention, to look for Him in the quiet places – and to be mindful that His ways are not ours, that He hears and answers prayers in His own time and in His own way. A very sweet true story. Cassandra writes in a very easy to read style, and you can feel the passion she has for her family, her animals, and her writing jump right off the page. Anyone who has ever loved a pet would enjoy this book. Very good read and enjoyed it! Annie Spruce is an excellent read. It will warm your heart, fill your heart with pride, and make you cry. I highly recommend this story for anyone with a heart. Dog lovers will want to read about Annie Spruce. This is a must read. Thanks to Goodreads First Reads for this great book. A quick read that makes you smile and cry. At the end of the book, my heart felt a little fuller. Cassandra Rankin proudly calls Alaska home. She her husband raise their children on a crazy little farm which boasts an ever-changing clump of animals and 4-H projects. In 2014, Cassandra won first place for Inspirational writing in the 83rd annual world-wide writing contest for Writer's Digest magazine. You can also find her pieces and her photos in Cirque, a literary journal for the north Pacific Cassandra Rankin proudly calls Alaska home. She her husband raise their children on a crazy little farm which boasts an ever-changing clump of animals and 4-H projects. In 2014, Cassandra won first place for Inspirational writing in the 83rd annual world-wide writing contest for Writer's Digest magazine. You can also find her pieces and her photos in Cirque, a literary journal for the north Pacific Rim. Her blog, This Crazy Little Farm (www.thiscrazylittlefarm.com) is where she writes her heart out as the farm chores allow, and her author website, www.cassandrarankin.net is a good place to order a copy of her book, as is Amazon.